According to his website, www.poochcafe.com, Paul Gilligan’s affair with art began in 1970, in kindergarten, when he figured out that he stunk at sports and that art was his only other option for impressing chicks. Weaned on Mad magazine, super-hero comics and “Bloom County,” Paul attended Toronto’s Sheridan College for animation and illustration and took comedy writing at the Film Institute in Ottawa. He tested out other jobs over the years such as gas jockey, carnie, night watchman and florist, before joining the Ottawa Citizen newspaper as its on-staff illustrator, where he won awards in both illustration and design. He also found work in advertising, editorial cartooning, storyboarding, comic books and animation, and finally set up shop in downtown Toronto as a free-lancer, where his roster of illustration clients grew to include the likes of Entertainment Weekly, Time, The Wall Street Journal, Disney, and Wired. During this time he created a number of strips, the culmination of which was Pooch Cafe. 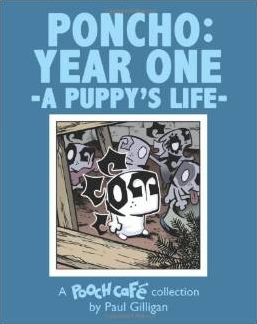 Pooch was the first comic of the new millennium, debuting on Jan 1, 2000 with Copley News Syndicate. 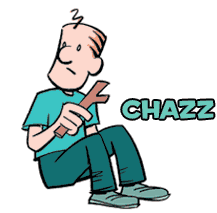 In 2003 it was picked up by Universal Press Syndicate, and since then it’s found its way into over 270 newspapers around the globe, including recent additions like London and Moscow. Paul does not currently own a dog, but he skulks around dog parks doing research, and is an avid viewer of “Dogs With Jobs” and “Scooby-Doo” reruns. L’IDEA: Paul, was being a cartoonist always your desire and aspiration? PAUL GILLIGAN: I’m one of those lucky people who always knew what they wanted to do. I started copying Don Martin drawings out of MAD when I was in grade 3 and I was hooked. In grade 2 I said I wanted to be a baseball player or astronaut. In grade 3, artist. L’IDEA: How did the comic strip Pooch Café came about and where does the name come from? 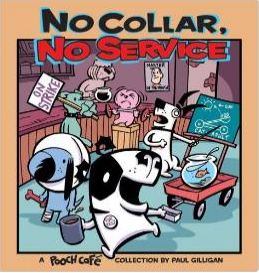 PAUL GILLIGAN: I tried a few other strips before Pooch, and the feedback I got was that the work was okay but the subject matter wasn’t sellable enough, the concepts were more outlandish and didn’t have a target demo. So I went: “Hmm, I don’t have a family, I don’t have a teenager, I’m not a senior, I’ve never worked in an office….” You sort of have to write what you know, so it was either a strip about dogs or a strip about a failed superhero-comic artist. The premise of Pooch Café is that a dog’s happy relationship with his master is thrown into a tail spin when his master marries a “crazy cat lady” and they move into a house loaded with cats. The dog then finds solace at the local canine hangout where they discuss life among the humans and how to get rid of the “fuzzy virus”. The name “Pooch Café” was a sort of pun on the obscure mixed brandy cocktail, the “pousse café.” The first person I ever mentioned the name to connected it immediately. And not a single other person since. L’IDEA: Do any of the human characters in Pooch Café carry any resemblance to people you know, whether as physical presence or as personality? PAUL GILLIGAN: Not intentionally, although friends have said they hear my voice when they read Poncho’s words. Probably because I’ve been known to spin off on rants. 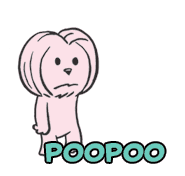 L’IDEA: Has any of the main characters in Pooch Café changed their physical appearance from the early years? PAUL GILLIGAN: Nothing substantial. Chazz used to have a pony tail, because I first envisioned him having some kind of “rad” occupation that he would force Poncho to tag along on. But that morphed into a more standard job and home life. Boomer’s eye used to not have a pupil, but I found adding one gave him more soul. Poncho’s ears used to touch his body, now they sort of hover magically over his head. L’IDEA: You have been publishing Pooch Café for over 14 years now. Do you find it difficult to come up with new ideas? PAUL GILLIGAN: The beauty of Poncho as a character is that he’s a dog when I need him to be, a buddy when I need him to be, a child when I need him to be. This helps facilitate a lot of material. 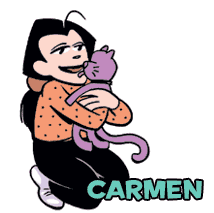 L’IDEA MAGAZINE: Which character from your own strip do you identify yourself the most with? PAUL GILLIGAN: For some reason I really identify with Poo Poo’s plight of being a little dog trying to protect the fire hydrant on his front lawn from other dogs. L’IDEA MAGAZINE: There are four book on Pooch Café (Pooch Café: All Dogs Naturally Know How To Swim, Bark To Work Legislation, Poncho: Year One – A Puppy Life, and No Collar No Service.) Are they all collections of previously published strips? 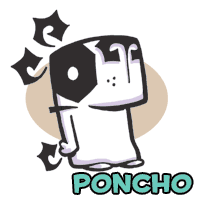 Will you in the future publish a graphic novel with Poncho as the main character? PAUL GILLIGAN: Three of the books you mentioned are straight up collections, but “Year One” is a cross between a collection and a graphic novel. There was a 15-month-long stretch of strips where I took Poncho literally back to the womb and re-envisioning his formative puppy years, including the meeting of Boomer and Chazz, his first introduction to this magical thing called “meat”, and learning what it is that makes him hate cats so much. I then edited these strips and supplemented them with about 100 new panels to make the read flow as a graphic novel. I’d love to have time to do another one, but the right concept hasn’t struck me yet. I have to say, there were times when doing such a long storyline was difficult, but it was important to me to reinvigorate both the strip and my enthusiasm. L’IDEA MAGAZINE: Did you ever expect Pooch Café would have been so popular and in such a relative amount of time? What is your fan base like? PAUL GILLIGAN: Like a lot of kids, I lay on the living room carpet reading the Sunday comics and dreaming of having my own strip one day. So pulling this off is the main reward by itself. It’s overall popularity is subjective, but I’m happy to be making a living. I think I have more of a cult following, which is code for a fanbase that’s small but fervent. L’IDEA MAGAZINE: In June of this year you debuted with another comic strip, Poptropica. Could you tell us how it came about and what is the storyline? PAUL GILLIGAN: Poptropica is a popular website where players can create avatars and travel through a plethora of interesting islands. The website’s creator, Jeff Kinney (of “Diary of a Wimpy Kid” fame) wanted a comic strip to go with it, and so he hired me to do the writing. There were pre-existing templates for the two main characters of Oliver and Jorge. I fleshed them out and gave them the motivation that they’re searching for a way out of Poptropica by traveling from island to island, kinda like that show “Quantum Leap”, like each time they hop to the next island it will be the one that leads them home. L’IDEA MAGAZINE: In Poptropica you share the credits with Kory Merritt. How do you operate in the creation of the strip with him? PAUL GILLIGAN: I do the writing, accompanied by thumbnails if necessary, and Kory pencils out the strips and runs them by me. I bring up any alterations that might be necessary for clarity, etc, and then he inks and colors the work. It’s been a fairly seamless collaboration thus far; Kory’s a great artist and super easy to work with. L’IDEA: Some media projects a gloom future for newspapers in general and for newspapers’ comics in particular. Do you agree with their view? PAUL GILLIGAN: I’m not really as up on this topic as perhaps I might be, considering my position in papers. But after the dip about 3-4 years back there seems to have been some stabilization. Perhaps this shows that papers will still be around in some form for a while yet. 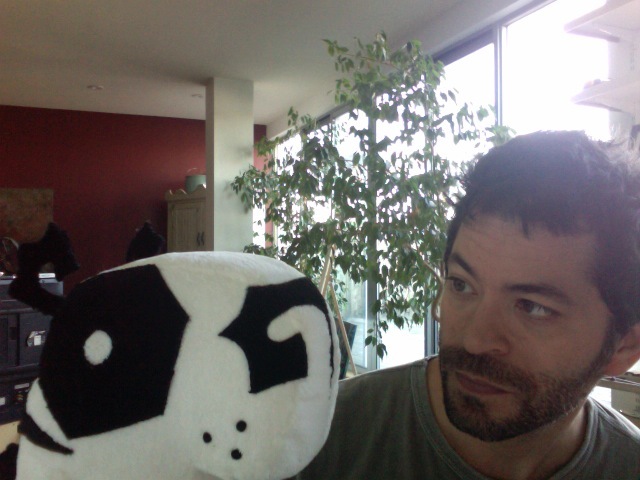 L’IDEA: Are you at the moment working on any projects not involving Pooch Café or Poptropica? PAUL GILLIGAN: I have an animated show in development, but I don’t want to say too much about it at this point, as it’s a years-long process. L’IDEA: You won several Studio Magazine and INMA Awards for illustration and a National Newspaper Award for design. Could you tell our readers something about that? PAUL GILLIGAN: I worked as an on-staff illustrator at the Ottawa Citizen newspaper for many years. During that time I was encouraged by the paper to submit the work in various contests, and I came out with a few awards from that. This was quite some time ago and I used styles that were painted. I haven’t used paints in illustrations in about 15 years. When I struck out on my own as a freelancer my style became more cartoony, black brush lines and colored electronically. L’IDEA MAGAZINE: What are the comic strips that you believe influenced you the most? Who are the comic strip artists you admire the most and why? PAUL GILLIGAN: I was influenced by the obvious guys, Larson, Watterson, Breathed and Shultz, but also by a lot of alternative comic book cartoonists, Peter Bagge, Daniel Clowes, Chester Brown, The Hernandez Brothers. Those guys really influenced my writing as well, and the marriage of the words and art on the page, which is really what it’s all about. I was also heavily influenced by superhero comics, which was a passion from about 12-17, and can probably be seen at times in Pooch. 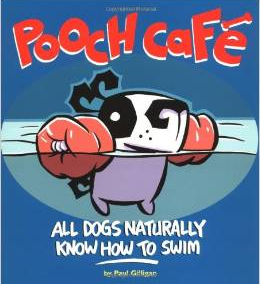 L’IDEA MAGAZINE: Is Pooch Café also becoming an animated cartoon, soon? PAUL GILLIGAN: Well, I sure wouldn’t mind if my animated show made it into production, I’d say that would be about as good as I can imagine. L’IDEA MAGAZINE: Paul, if you could choose to meet a person, any person in history, regardless of time constrictions, who would that person be and why? PAUL GILLIGAN: My father, as a twenty year old, in lower Manhattan, so we could go on an all night drinking binge together.